FINANCE MAP is a unique service which explains the world of finance to students and others seeking internships or jobs within financial firms. It has already proved invaluable to many wishing to secure employment in the sector. It is a one-on-one tutorial with Matthew Craston lasting two-and-a-half hours. At the end of the session students will have a clearer grasp of how the sector works and in which role they will be best suited. The price of the tutorial includes phone conversations prior to actual interviews. 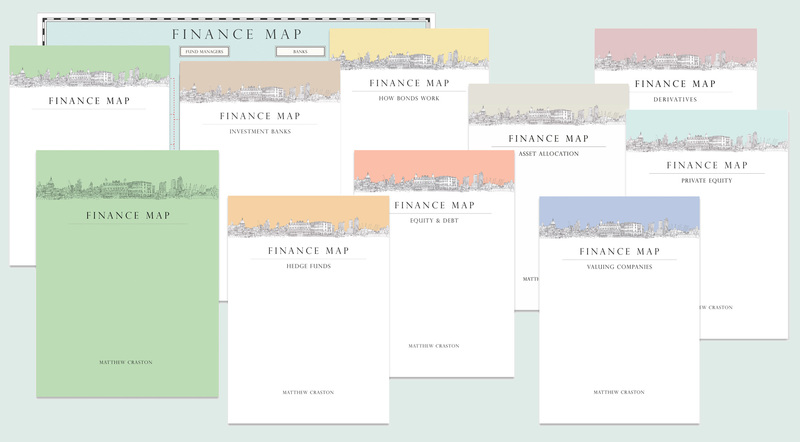 Based on his 30 years of experience in this market, Matthew has created his finance map, which he uses to describe the activities of all the key participants, especially banks and fund managers. He has also produced explanations of all the most important financial topics – shown in the illustration. Finance Map tutorials have also been used by professionals in other fields simply wanting to learn more about finance, for example to run their own businesses, or to understand and manage their investments. I just got offered the job! “The tutorial was easy to understand, yet provided a comprehensive foundation to build upon. I received a job offer during my internship, and I’m certain that the confidence I gained from my tutorial and Matthew’s continued support helped.